I felt embarrassed about the crappy pictures of the Zoya Pulse collection that I posted, so when I had some sunlight the other day, I snapped a better picture. Here's Jacy. I think I captured the shimmer a little better this time. If you click the picture, I think you'll be able to see the pretty pink sparkles. Thumb to pinkie: Blair, Colbie, Sloane, Rihana, Mikka. And, a sidenote: I'm working on all of your requests. I know I've been behind in posting lately, but I really love your requests and I'm picky about getting the perfect picture for you! Always feel free to email me (with the word 'request' somewhere in the email or subject line, cause it makes searching my email a little easier ;-) ) or leave a comment with a request. I may not be able to post it right away, but I really enjoy doing them. No Scrangie.. *you* are the best, for trying to fulfill individual requests for swatches. I adore you for that, and your pics are always so gorgeous! Scrangie, you are awesome and not behind at all! I am always impressed that you put something up every couple of days and manage to have fantastic pics and perfect nail polish. Your pictures and the word crappy should never be together in the same sentence! And the Zoya Pulse-collection is amazing! You take beautiful pictures, in face I always refer to them before I make my np purchases online - You had me completely sold on Blair and Mikka from the Pulse collection. I can't wait til they arrive!! I NEED Jacy! The others I think I can do without. And, as always, your pictures are amazing! Oh my!! Zoya always draws my attention and every single one of them is fabulous! Lovelovelove! Omg! Sminkan and I had the same love thought :O The two of us often think alike! Sminkan, awwwww! :) And I hope so too, you will love them! Anonymous, welcome! I hope you enjoy my future posts, I'm happy to have you here! Claire, thank you! Jacy is very fascinating, I love it! Rocketqueen, hooray!! I really love Zoya polishes, they have such great colors! Kayvid(MUA): Holy Moly! This is one awesome blog...just chanced upon it and now I'm hooked. Love the swatches. I am a newbie, could you please help me by pointing out whihc stores I can buy China Glaze, Zoya, Misa and Orly at? And I mean, new collections and everything. Thanks! As for requests, I agree with all the readers who have been asking you to give us a list of your top polishes...I know, I know, too many! Maybe dividing them by colour category or brand would help. Looking forward to your list!! Your nails are so gorgeous! I love the Jacy color! Sorry, for some reason I thought I was logged in but it still said I was "anonymous"...oh well! Anyway, thanks for clarifying that Scrangie! I accidentally ordered Blair then, so I will have to get Colbie too. The salons here that sell Zoya have NO IDEA about this collection...so maybe they'll never get it in. 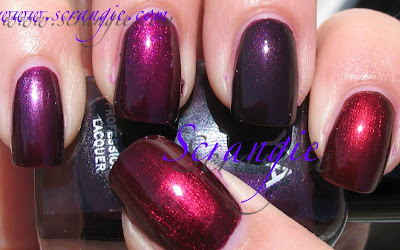 Anyway, I love Blair too from the "fake" Colbie swatch, so I don't mind owning both! Thanks Scrangie!! MY Never Enough SHoes looks a touch browner..love the ZOyas!!!!! I love them Scrangie! Is Sloane similar to ChG Midnight Ride (or anything else)? How do you feel about MAC polishes? Pimentoplane, thank you so much!